The UT Department of Art has announced Leslie Adams’ solo exhibition, “The Handwritten Dreams Project,” has closed. The artist’s reception and accompanying lecture scheduled for Friday, July 6 (rescheduled from June 1), at the Toledo Museum of Art’s Little Theater also has been canceled. As a result of the continuing air conditioning and ventilation issues in the Center for the Visual Arts on the University’s Toledo Museum of Art Campus, the exhibition, organized and curated by Gallery Director and Assistant Professor Brian Carpenter, was removed recently due to extreme temperature and humidity conditions in the building. An expert in the field of conservation was consulted and recommended that the work be moved to a safer, climate-controlled environment. According to Barbara WF Miner, professor and chair of the UT Department of Art, “The Handwritten Dreams Project” is a tour de force and the department is committed to working with Adams to find a time and venue to present the interactive exhibition in Toledo. Adams received a bachelor of fine arts degree from UT in 1989. Creating a culture of wellness and work-life balance is at the heart of the University’s employee wellness program, Healthy U. Over the last three years, Healthy U program enrollment has doubled to 2,100 employees. Featured events this past academic year included Rocket Recharge, which featured stress-relieving activities such as yoga, art therapy and gardening; Mindfulness Training, which taught meditation techniques to help with relaxation and stress-reduction; and the Toledo Heart Walk, which garnered strong participation by faculty and staff across UT campuses. Most recently, Healthy U collaborated with the Benefits section of Human Resources to implement a wellness incentive program for faculty and staff who elected the Blue medical plan. This incentive offers eligible employees the opportunity to earn an additional employer contribution toward their health savings account by completing a variety of wellness activities, including taking a health screening and online health risk assessment, receiving an annual flu shot, and participating in campus Lunch ‘n Learns. 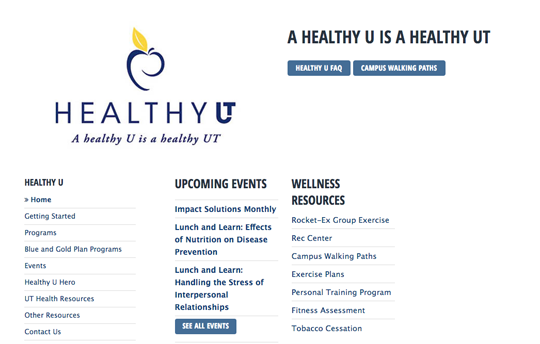 Additionally, Healthy U implemented the WellDimensions program, which is available to employees on both the Gold and Blue medical plans. This program offers work and home activities that focus on several dimensions of wellness, including meal preparation and planning workshops, physical activity tracking, and financial wellness resources. “By using our various partners and resources, we’re able to bring experts to campus and empower employees to improve all dimensions of their well-being,” said Wendy Davis, associate vice president and chief human resources officer. Upcoming Healthy U offerings this summer include the following Lunch ‘n Learns: Handling Stress on Wednesday July 25, and Retirement Planning 101, on Tuesday and Thursday, Aug. 7 and 9. For more information about Healthy U and a complete list of programming, including additional details about the summer Lunch ‘n Learns, visit utoledo.edu/offices/rocketwellness/healthyu. Researchers at The University of Toledo have designed a first-of-its-kind gene-targeting molecule that could serve as a therapy to stop cancer growth and to help cancer patients who are resistant to current drugs. Dr. Terry Hinds, assistant professor in the UT Department of Physiology and Pharmacology, and Lucien McBeth, a second-year medical student, received a full international patent last fall for “Sweet-P,” a new type of anti-cancer molecule. Dr. Terry Hinds, right, is quick to credit his research team for helping to discover Sweet-P, a new type of anti-cancer molecule. 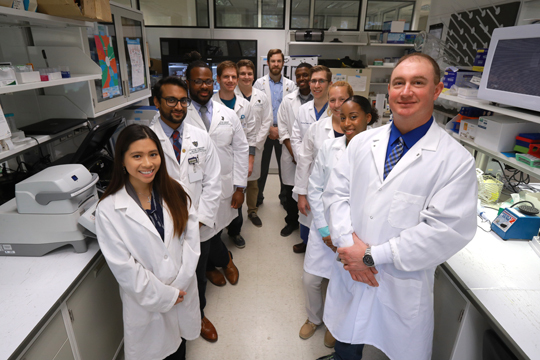 Team members are, from left, Maggie Wong, Vikram Sundararaghavan, Darren Gordon, Charles Hawk, Justin Spear, Lucien McBeth, Abdul-Rizaq Ali Hamoud, Jonathan Demeter, Kari Neifer-Sadhwani and Jonnelle Edwards. Sweet-P has the potential to be a unique anti-cancer therapy, Hinds said, but more research is needed. It first needs to be used in preclinical investigations in mice before it can be tested in human patients. Like many scientific discoveries, this one came about as Hinds and his team were studying something else — obesity. Their work centered on GR beta, one of two proteins that originate from a gene called the glucocorticoid receptor (GR). Hinds genetically modified stem cells to have a higher level of GR beta and hypothesized based on other studies that the stem cells would change into large fat cells. But they didn’t. They rapidly proliferated instead. “GR beta was driving the growth phase of the cells,” Hinds said. This discovery led Hinds and his team to ask more questions about GR beta, which is known to cause cancer cells to grow, proliferate and migrate. Hinds’ team focused on the place on a gene where small RNAs, in this case microRNA-144, bind on the GR beta gene. Very little is known about microRNA-144 or what it specifically controls, but reports show that levels of it are significantly higher in patients with bladder cancer. No one had ever created a drug to target microRNA-specific interaction with a gene. So Hinds got to work. The end result is Sweet-P, a peptide nucleic acid molecule that resembles DNA. Hinds tested the molecule on bladder cancer cells and found that it did indeed suppress GR beta. It latches on to the microRNA binding site of the GR beta gene and stops the microRNA from activating the protein. If the GR beta doesn’t work properly, the cancer cells don’t migrate. Think of it as a basketball game. GR beta is the point guard, the playmaker. It sends the basketball (a signal) to other players (the cancer cells) to move and drive to the basket (other parts of the body). MicroRNA-144, then, is the coach screaming at GR beta to go faster. Sweet-P is akin to the referee giving a technical foul to silence the “coach” and slow down the game. Because Sweet-P targets just one specific gene interaction — between the microRNA and the GR beta gene — it could significantly reduce side effects of potential treatments created with it, Hinds said. “It’s precision medicine at its best,” he said. Sweet-P’s ability to target GR beta could have implications for treating other cancers in which GR beta is highly expressed, including glioblastoma, an aggressive brain cancer, and prostate and lung cancers. Sweet-P also could be a potential treatment for other diseases, like asthma, Hinds said. Glucocorticoid hormones (GCs), the most commonly prescribed anti-inflammatory drugs, are often used to treat asthma, as well as cancer and other diseases. A high level of GR beta can cause those hormones to become ineffective, a condition known as GC resistance. Asthma patients often have high GR beta in their airways. “When Sweet-P inhibited the GR beta, it increased the responsiveness of GCs, so Sweet-P may reverse GC-resistant diseases,” Hinds said. If Sweet-P someday becomes an approved therapy, Hinds, who has asthma, might be able to get rid of the EpiPen on his desk. West Rocket Drive on Main Campus is scheduled to reopen to two-way traffic Monday, July 9. The street will continue to be closed for through traffic from the railroad tracks to West Towerview Boulevard for one extra week, according to Dan Perry, electrical manager with Facilities and Construction. “New sidewalks and a portion of the road are going in, and we want to give the concrete extra time to cure,” he said. Traffic will be able to enter lot 12 by the Law Center, lot 26 by the Student Medical Center, and lot 26E by the Horton International House from the north. Drivers can detour around the construction via Secor Road and through lot 25 by Rocket Hall. Crews have installed a tunnel system between two steam vaults and new steam lines, Perry said. Campus Rec Magazine serves as the premier business resource for college and university recreation centers and seeks to educate and empower leaders within these facilities while also providing them with the best possible services and products. Established in 1965, UT Recreational Services’mission is to enhance the human condition with a focus on health and well-being by providing programs and services that enrich the learning of students and the campus community. UT Recreational Services offers four different facilities: the Student Recreation Center, Carter Field and the Health Education Building on Main Campus, and the Morse Fitness Center on Health Science Campus. The numerous features of these facilities are highlighted in the magazine; for example, the Student Recreation Center’s weight and cardio equipment, five basketball courts, indoor track, auxiliary gym, aquatic center with three pools and climbing wall are mentioned. Other features acknowledged by the magazine are the fitness studio at the Morse Fitness Center, four basketball courts and five-lane therapy pool in the Health Education Building, and the nine acres of land that Carter Field provides for intramural sports, sports clubs, varsity football practice and other campus events. UT Recreational Services also offers programs for guests or members. These include private swimming lessons, competitive sports, personal training, first aid, lifeguarding and more. 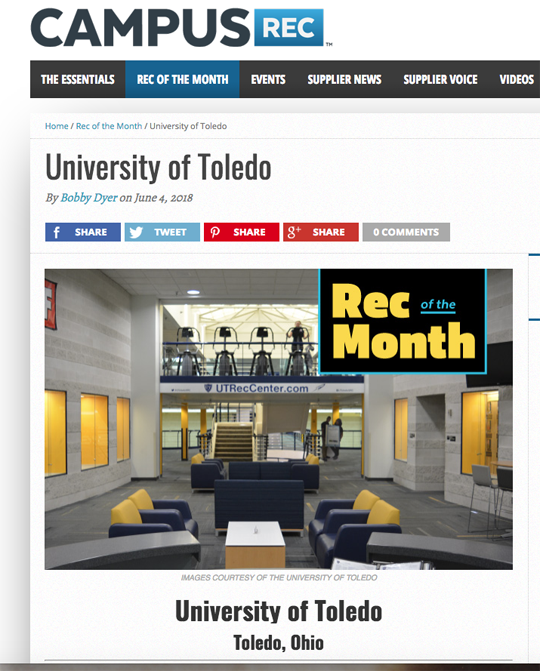 By being featured in this month’s issue of Campus Rec Magazine, UT is being recognized as a national leader in providing highly impactful recreation, health and well-being services to students, faculty, staff, alumni and community members, Pryor explained. To learn more about the services and programs offered by UT Recreational Services, visit utoledo.edu/studentaffairs/rec. Starting Friday, June 29, traffic will move to the north side of Bancroft Street so work can begin on replacing the other half of the pavement between Secor Road and Westwood Avenue. Also that day, traffic on University Hills Boulevard will shift from the west to the east side. Traffic will be maintained in both directions on Bancroft Street and University Hills Boulevard during the project. Drivers should note there also will be northbound curb lane restrictions on Secor Road between Kylemore Road and Bancroft Street. During phase two of the project, Brookdale Road will only be accessible from Secor Road and Kylemore Road. In addition, the section of Brookdale between Kylemore and Bancroft will be temporarily changed to a two-way street. These traffic changes will be in effect through August, according to the Toledo Division of Transportation. Road replacement is expected to be finished by November. To avoid congestion, students, employees and visitors to Main Campus are encouraged to use the west entrance off Secor Road or the south entrance off Dorr Street. A section of the sidewalk directly behind Carlson Library will close Thursday, June 28. In conjunction with the replacement of the bridge behind the library, part of the sidewalk will be replaced, according to Doug Collins, director of grounds and transportation. Visitors will be able to enter Carlson Library on the south side, but a portion of the walkway will not be accessible, he said. “We apologize for the inconvenience, but we’re improving the sidewalk and appreciate the patience of campus community members,” Collins said. The sidewalk replacement project is expected to be finished Friday, July 13. 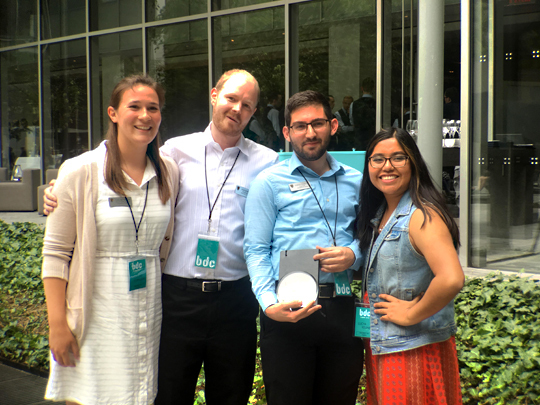 UT students who thought outside — and inside — the hive won the Outstanding Field Research Award June 22 at the Biodesign Challenge Summit in New York. “Apigiene Hive: Rethinking Bee Hygiene” was selected for the honor that recognizes a team that takes the initiative to go into the field and interview experts as well as potentially affected communities in order to find and understand the social impacts of their project. Members of the UT team — from left, Madeline Tomczak, Jesse Grumelot, Domenic Pennetta and Lucya Keune — posed for a photo with the Outstanding Field Research Award they won June 22 at the Biodesign Challenge Summit, which was held at the Museum of Modern Art in New York. Members of the UT team are Madeline Tomczak, who graduated with a bachelor of science degree in environmental science in May; Domenic Pennetta, a sophomore majoring in art; Jesse Grumelot, who graduated in May with a bachelor of science degree in bioengineering; and Lucya Keune, a senior studying visual arts. The four were in New York for the award ceremony and exhibition with Brian Carpenter and Eric Zeigler, assistant professors in the Department of Art in the College of Arts and Letters, who taught the Biodesign Challenge class spring semester. Solving problems creatively is what the Biodesign Challenge is all about. The Genspace NYC program offers college students the chance to envision future applications of biotechnology by working together interdisciplinarily. At UT, the Biodesign Challenge class brought together students majoring in art, bioengineering and environmental science, as well as peers from the Jesup Scott Honors College. UT went head to head against 29 schools from across the United States, Australia, Belgium, Canada, Colombia, France, Guatemala, Japan and Scotland. Six awards were presented at the challenge. 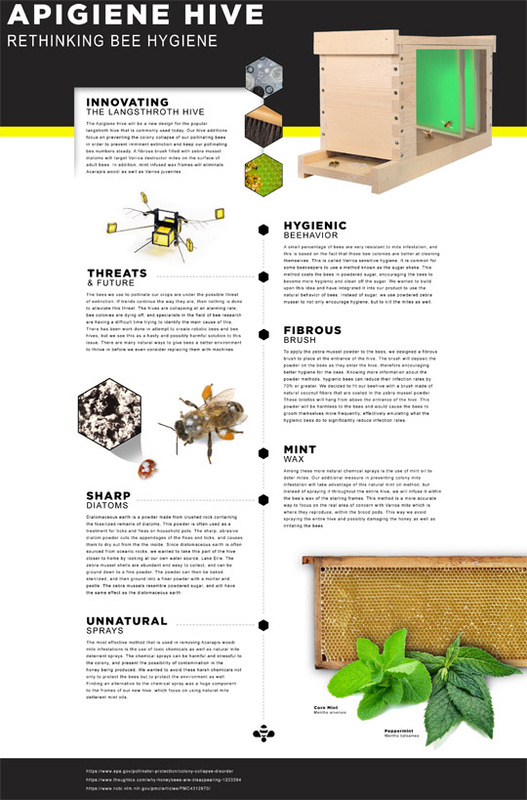 The UT team wanted to help the bee population and created additions for the popular Langstroth hive to fight one of the insect’s biggest foes: mites. A fibrous brush filled with zebra mussel powder at the hive entrance targets Varroa destructor mites on the surface of adult bees. The insects will clean off the powder — and the mites — and leftover powder will help kill the intruders inside the hive. And to tackle the Acarapis woodi mites, which invade the hive and lay eggs, the team turned to a natural deterrent: mint, which was infused with the wax frames. At the Museum of Modern Art in New York, the UT students presented their project to more than 200 scientists, designers, entrepreneurs and artists. 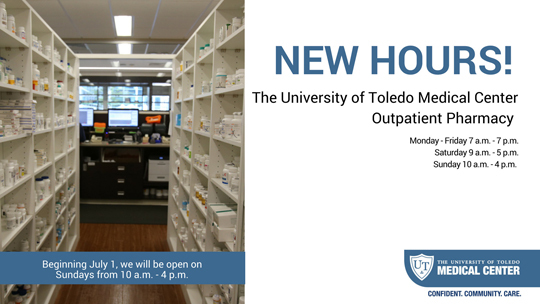 The University of Toledo Health Science Campus Pharmacy is expanding its operating hours to provide services on Sundays. Beginning July 1, the pharmacy located in the Medical Pavilion will be open from 10 a.m. to 4 p.m. on Sundays. The pharmacy continues to operate from 7 a.m. to 7 p.m. Monday through Friday and from 9 a.m. to 5 p.m. on Saturdays. The automated refill hotline also is available 24/7 at 419.383.3750. Visual Storytellers: Own Your Narrative will be held from Monday, July 9, through Friday, July 20, at The University of Toledo Center for Performing Arts. 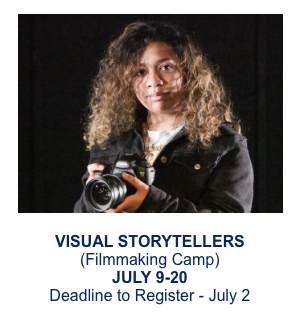 This workshop is a filmmaking summer camp for high school juniors and seniors who wish to grow their narrative video-making skills. It will take place from 10 a.m. to 4 p.m.
Students will learn to conceptualize, write, light, shoot and edit films, with an emphasis on creating visually. The camp will help students grow creatively while also allowing them to experience college-level seminars lead by Quincy Joyner, assistant lecturer in the UT Theatre and Film Department. Workshop objectives include articulating the components of a story, character and narrative; explaining the effectiveness of communicating visually; and conceiving, designing and communicating a story while cinematically employing practical filmmaking techniques. Students also will have the opportunity to learn about narrative storytelling, understanding the frame, lighting, video editing and more. The cost of this workshop is $350 and is due Monday, July 2. The fee covers all materials that students will need, and lunch also will be included each day.